The last snowfields have just disappeared and the ravishing corollas of crocuses are already appearing. These fragile stars with fresh colours are announcing spring. With their plain, variegated, striped or colour-gradient corollas, these cute little flowers are widespread in our latitudes. They are found in gardens, parks, lawns, rock gardens, or even in pots or planters on balconies and terraces as well as in the undergrowth, along paths and at the foot of trees. Originating from a vast region of Europe ranging from the Alps to the Mediterranean Sea, crocuses belong to the family of Iridaceae, whose emblem is the royal iris. 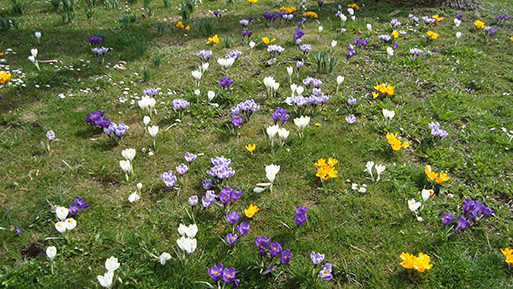 There are between 70 and 80 kinds of crocuses in the world and there are a large number of horticultural varieties. Their name comes from the Sanskrit kunkumann which became crocus in Greek, which means saffron. The crocus variety Crocus sativus has been known for more than 3,500 years all over the world for the quality of its saffron, which has made the reputation of the producing village of Mund in Upper-Valais (Switzerland); it enjoys a label of origin. Saffron is the most expensive spice in the world. This is easily understood if one considers that not less than 150 flowers are necessary to produce a single gram of saffron. But what an aromatic power! One distinguishes the crocuses planted in autumn that bloom in spring and those planted in spring that blooms at the beginning of autumn (Colchicum). One of the late varieties of crocuses is indeed the famous colchicum celebrated in the nostalgic nursery rhyme: "Colchic in the meadows bloom, bloom... Colchic in the meadows, it is the end of summer". 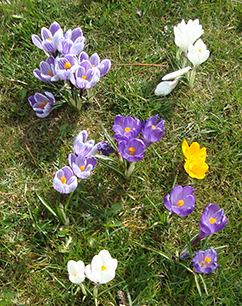 However, most crocuses bloom in spring as soon as the snow melts. These early varieties are providential for starving bees and other pollinating insects after the long winter period. By offering them a first supply of pollen and nectar, they allow them to survive a critical period. A place exposed to the sun or weakly shaded is suitable for planting. The crocuses like light but not moisture: as you can easily see, they open to the sun and close when it rains. The bulbs, also called corms, will be placed at a depth of about 5 cm, if possible in groups of five to ten, separated from each other by about ten centimetres, in order to obtain a harmonious flowering. A simple well-drained garden soil, of which one will have worked the surface by incorporating sand, if needed, is perfectly suitable. If the bulbs are planted in pots or in a planter, the soil will consist of one third of top soil, one third of soil for planting and one third of sand. After planting, cover the soil, pack lightly and then water. Consequently, crocuses will grow without any fuss and even naturally multiply from one year to another without need to intervene. During the cold season, however, it is good to ensure that the land is not too wet. Care should be taken not to cut the leaves until they are yellowed and wilted, to allow the plant to replenish its reserves after flowering. As for the faded flowers, they are, if possible, gradually eliminated. Crocuses are hardy plants that are valiantly resistant to disease and pests, but can do nothing against the voracity of some enemies. Gardeners, beware of mice, field mice and other rodents, which feed on young bulbs without mercy. Each of us can find, in the depth of our memory, the painful remembrance of an unfortunate fall in a patch of stinging nettles and the terrible stinging that instantly affected whole areas of our skin! Fortunately, the burning itch does not last long; and this little loved plant has more merit than one might think. Indeed, its assets exceed its modest appearance, especially in the area of nutrition. The nutritious qualities of the nettle plant helped the alpine population to survive the last great famine that struck Switzerland in the early 19th century. In 1815, the eruption of the Tambora volcano in Indonesia released an amount of energy equivalent to 170,000 atomic bombs from Hiroshima. This disaster killed 90,000 people in the area and, in the years that followed, claimed thousands more victims in Europe and Switzerland. The ashes from this eruption rose to an altitude of 30 km and circled the earth, obscuring the sky and causing a drop in temperature of -2.4° C in the northern hemisphere. Nowadays, nettle lovers find these plants readily along paths and rivers, in abandoned fields and on the edge of a forest where they enjoy favourable growing conditions. The whole plant should be picked and the fresh upper leaves removed at home. As a precaution, avoid leaves in the lower part of the plant that can be soiled by animal dung and nettles that grow on roadsides or near fields treated with chemicals. 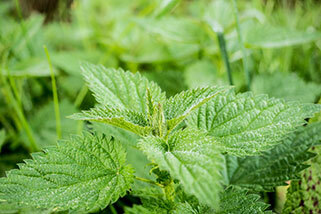 Nettles can be eaten by cooking the leaves like spinach. You can make soup, salad, pies, even herbal tea. It is often found in the beauty products section of specialised stores. The reason that nettles so bitingly sanction those foolhardy enough to come into contact with it, is because it has developed an effective defence against the greed of herbivores and insects. Picked in the wild, the common nettle costs less than a radish! The plant's sophisticated strategies can do nothing against a wise gardener: just put on gloves, get a pair of scissors and go pick a goodly load. 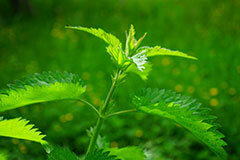 There is no lingering danger of stings: as soon as it is picked, the nettle loses its sting. Knowing this, why abstain? 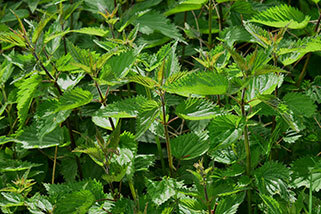 - Harvest an armful of nettles. - Remove and wash the tender leaves. - Heat two tablespoons of oil in a pot. - Slowly cook a sliced onion on low heat. - Add 4 peeled potatoes cut into cubes. - Add the nettle leaves. - Cover with water, salt and pepper. - Bring to a boil and simmer on low heat for 30 minutes. - Serve with fried potatoes. Have you ever picked a ripe orange fresh from the tree in southern Europe and eaten it straight away? Then you will know what difference it makes in taste to consume regional fruit or vegetables. Too early harvesting and long transport routes contribute to the loss of aroma in food from distant countries. This makes it all the more sensible to use domestic products. In winter the selection is smaller than in summer, but not less tasty. In the cold season, many vegetables are in high season. It is no coincidence that winter vegetables are rich in vitamins. Red cabbage or white cabbage contains a lot of vitamin C. Beetroot is full of minerals such as potassium, magnesium, iron and calcium. The pumpkin is in no way inferior to this and trumps with the vitamins A, E and C up. And although you don't see it one wouldn't think that the leek contains a good portion of Beta Carotene. Our body needs all these vitamins for a strong immune system. And that is what we need in order to remain through the winter healthy. Winter vegetables are not only an excellent source of vitamins, but also very aromatic. On the beetroot, people are of divided opinion. Some love them, others hate them. Many people only know it in the inlaid version. However, it tastes quite different as raw vegetable salad or cooked with a creamy cream sauce. With its high content of betaine, it supports our digestion and thus the smooth elimination of metabolic products. The red tuber is also visually appealing and brings a powerful dash of colour to the plate. Let's get to Brussels sprouts, a real nutrient miracle. It is one of the vegetables with the most dietary fibres and is one of the best suppliers of potassium. Although the little florets are such power packs, not everyone likes them. The reason for this is their slightly bitter taste, which especially children are not so enthusiastic about. The Brussels sprouts, for example, often have a miserable existence as a side dish. However, it is quite different as a main course. In combination with curry, it immediately gets a completely different note and its bitter substances move discreetly into the background. 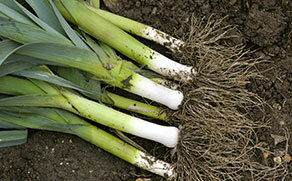 Let's have a look at another winter vegetable, the leek. Allicin is the name of the substance that distinguishes it. This sulphur compound is said to have an antibacterial effect. It is also the reason for the onion-typical smell of vegetables. Due to its intense taste, it can be used as a condiment to spice up a dish. It is also delicious as a cake, soup or risotto. It has a strange name, the butternut squash. Its shape, similar to that of a pear, is also somewhat unusual. So it's not surprising that it is also known as a pear squash. What characterizes it is its particularly soft flesh, which tastes discreetly of butter. However, it does not only impress with its taste, but also with its ingredients such as vitamin A, vitamin C, potassium, magnesium and calcium. On the plate it shines in many variations. Whether as soup, puree, roasted or raw, its nutty note matches many dishes. The fifth vegetable in the bunch is cauliflower. It may not look like this, but it is quite a vitamin C bomb. 100 grams of cauliflower contain as much vitamin C as 100 grams of oranges. In its luggage it also carries vitamin K, which is important for blood clotting. Cauliflower is easily digestible and can be eaten raw. Especially, in the cold season there are of course recipes where it is prepared warm. Whether raw, cooked, baked or fried, the white florets are quite something. With crisp winter vegetables, there is no winter blues in the kitchen. And if you don't like these five, I'm sure one of the many others will. Instead of cold weather there are now warm dishes – Enjoy your meal. The quantities quoted refer to two persons. Cut half of the onion into fine rings. Then fry them in some oil until they are brown and crispy and put them aside. Cut the cleaned leek into fine rings. Chop the remaining onion and garlic and briefly stew in hot oil. Add rice, briefly stew and then top up with wine and broth until it is just covered. Let it simmer in the covered pot over medium heat. Stir occasionally and top up with wine and broth. 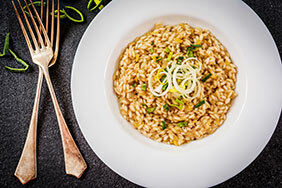 The risotto takes about 30 minutes to cook. Add the leek 10 minutes before the end and let it simmer. Finally add the cheese and season to taste with salt and pepper. Serve with the fried onion rings.